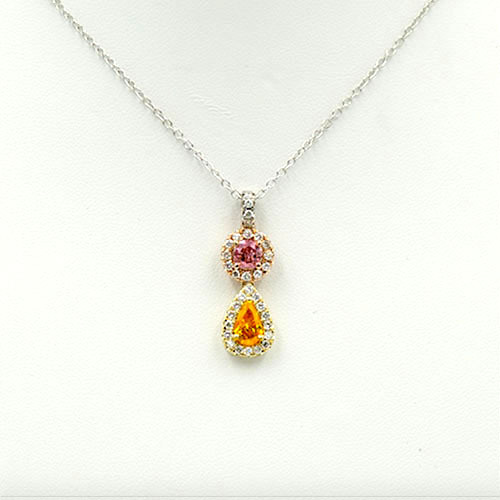 Two Stones Pendant Necklace: A 0.50ct BR Fancy Brownish Pink Diamond,GIA Set in a 18kt Pink Gold surrounded by White Melees (12) and a 0.58 PS Fancy Intense Orange Yellow Diamond,GIA Set in a 18Kt Yellow Gold Surrounded by White Melees (17). Total of White Melees ( 32= 0.72ct). In a White Gold 18Kt 16 inches, with a hook white gold with 4 white diamonds mellees.